← Why do insect bites transmit disease? Ultraviolet light is pretty nasty stuff. It’s known to cause skin cancer in humans. 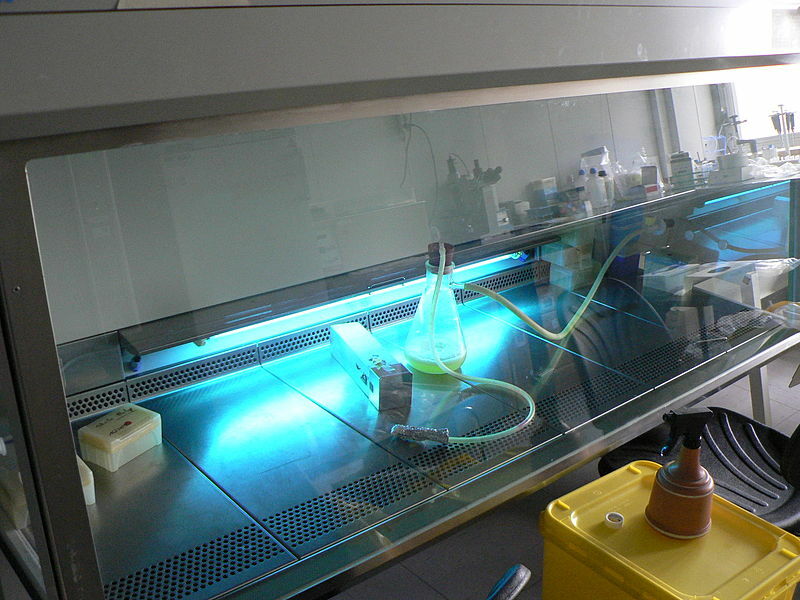 UV light is a standard material for inducing mutations in lab experiments. It’s also used to sterilize biological safety hoods. It has a wide spectrum of lethality because it mutates the genetic code into nonsense. If the organism can’t read the genetic code, it can’t go on living. Ultraviolet light does kill insects as well, and it’s commonly used in quarantine labs to keep potentially dangerous insects from escaping into the environment. It’s also been investigated as a way to kill stored product pests without resorting to pesticides. This doesn’t mean it would be a good idea for home use, because the lights are set up in such a way that scientists are only exposed for a few seconds at a time, but UV light does kill insects. UV sterilization in a lab. This is where I originally intended to end the post, because it’s a fairly straightforward answer. UV light kills insects, and even has some applications in industry and agriculture because of this property. It’s a safety hazard, and shouldn’t be used in the home…but insects aren’t immune to the effects of UV light. While writing this article, I was reminded of a rather interesting paper I read awhile back. It turns out that UV light isn’t the only harmful type of light. It also turns out that blue light might kill insects as well. 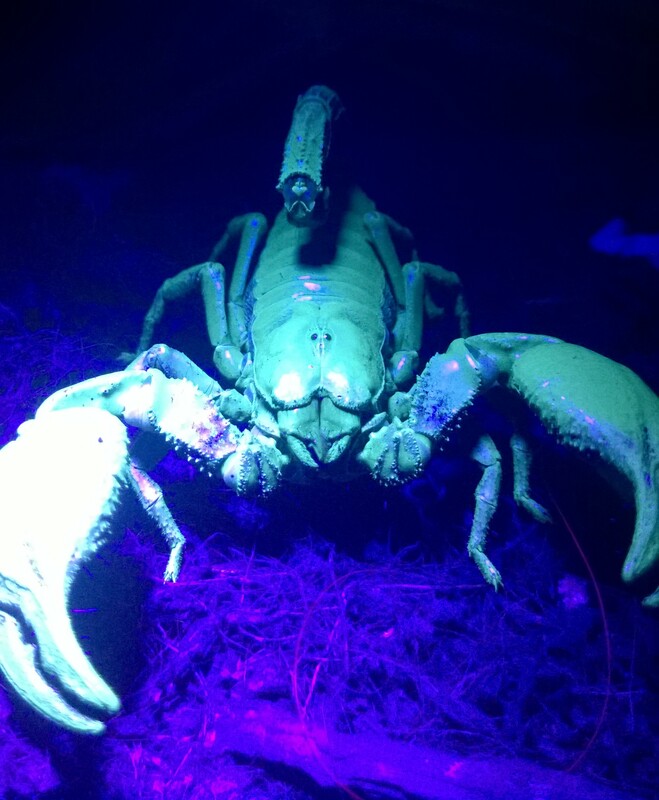 Scorpions glow under UV light. But it’s not good for them to have prolonged exposures. Late last year there was a paper titled Lethal effects of short-wavelength visible light on insects published in the journal Scientific Reports. Scientific Reports is kind of Nature’s answer to PLOS One in that it’s open access, and focuses on papers that are a bit unusual. The paper was shown to me by a colleague, and I wasn’t quite sure what to think about it at the time. I’m still not sure what to think, although I do find the data very convincing. It’s thought that blue light is a major cause of vision problems as a result of aging. I admit I’m not familiar with the effects of blue light in general, but it appears to act somewhat similar to UV light by causing chemical changes in tissues which result in damage. The chemicals damaged are different between UV and blue light, but both UV and blue light are very high energy wavelengths which transmit a lot of energy to tissues. Bill Nye does an awesome job of explaining the light thing. All organisms absorb and reflect certain wavelengths of light, which gives them different colors as Nancy noted in an earlier post. So…light can cause damage in sensitive tissues in humans but it’s not known how it affects more robust tissues in humans or any other animals. UV light is a high energy wavelength, and blue light is also a high energy wavelength…so it makes sense that blue light would have an effect on sensitive tissues. 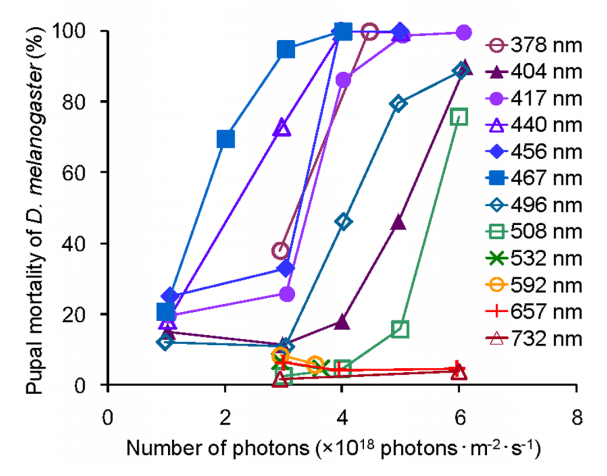 The paper by Hori and colleagues compared how insects fared when reared under different light wavelengths. When reared under certain colors, they were fine…but when reared under blue light the insects usually died or suffered very high mortality. The optimal wavelength was slightly different for every insect, which could imply that different systems are affected, but in each case the most effective wavelength was in the blue range. Blue light kills the fruit fly Drosophila melanogaster. I’ve thought a lot about this paper since I read it, and as far as I can tell the data is pretty solid. The insects used are all very hardy laboratory model animals, and are very easy to maintain in the lab. They controlled for stress of rearing under continuous light. Their lights emitted very narrow wavelengths of light, and didn’t appear to ‘leak’ into UV spectra. LEDs don’t emit a whole lot of heat, and the temperatures were pretty standard for insect rearing temperatures. The intensity of light is similar to what they’d be exposed to in direct sunlight, and all insects were exposed to similar amounts of light. This is the kind of paper which gets me excited. If someone would have told me about this over lunch, I probably wouldn’t have believed them. Even though the results aren’t as extreme as those seen with UV light, I think the paper makes a pretty compelling case that blue light does harm insects. Hori M, Shibuya K, Sato M, Saito Y. 2014. Lethal effects of short-wavelength visible light on insects. Scientific Reports 4 : 7383 | DOI: 10.1038/srep0738. This entry was posted in Physiology and tagged Bugs, Insects, Pest, Pest Control, Sterilization, UV Light. Bookmark the permalink. 13 Responses to Does UV light kill insects? What about other types of light? How can this be used to control a golf course superintendents nightmare insect?, The annual bluegrass weevil better know as ABW. Seems like a great application which could help reduce pesticide usage as well. Just not sure of the practicality of the application. Just food for thought, thanks for response. I don’t think the UV light would be strong enough to penetrate the packaging. Also UV light is used to clean the soda cans. Some beer companies used a UV varnish to protect the labels. So I don’t think you’d have to worry about anything if they were packaged well. The can would probably block the uv light, but even if it didn’t, the uv light is only harmful to living things. So unless there’s something living in the soda, you should have nothing to worry about that. Will the customers get exposure to the uv light or do you only plan to turn it on when building is closed? As of right now this research is still in it’s preliminary stages. We don’t have something sustainable or for high areas yet, but we’re working on it! Am interested in trying to use UV to kill insects in an indoor garden. I understand that it’s very hazardous to us, so I would plan to have those lights on a timer to be on when the area is not occupied. What might be a guess on the length of time the lights would need to be on to be effective? Should have the lights on for short times multiple times during the day? Also, what would be best to use, UV-A, UV-B or UV-C? In the lab space, we usually use 20-30 minutes to disinfect the area. Wavelenghts around 260 nm–270 nm should be effective. I’m not exactly sure how that relates to type. You can read more about the process here. Please remember that this treatment is usually used for bacteria/viruses. It’s still really new in the field of insects and we’re not exactly sure the efficacy. Are there any indications that it’s toxic to plants? UV light can be toxic to plants, for the same reason it’s toxic to bugs. UV light can be harmful to plants…so it’s not a great way to control insects. Many greenhouses use UV light to kill pests before they enter, and sterilize clean rooms. I have a greenhouse with some tomato plants under lights in preparation for fall. I was experimental my on the eff cts of different types of light on their growth, so I have a led light with blues and reds, and a t5 fluorescent. I found today that I have a bit of an aphid problem, but interestingly it is only affecting the plant that is under the flourecent lights… The plants are sitting only a few inches away from each other. I’m wondering if the blue lights in the leds are keeping the aphids at bay. Any thoughts? It’s hard to say. Just because something kills bugs under laboratory conditions, doesn’t neccessarily mean it will control them in a greenhouse situation. Bugs can hide from light pretty easily in most places. UV light should be able to kill insects but the exposure to the UV light should be high and long enough. Because of this, plants will also have to suffer from the exposure to UV light.